When it’s time to replace the Canon LV-7355 projector lamp the LAMP REPLACE indicator will light yellow. 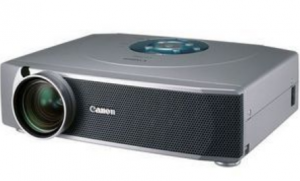 Your Canon LV-7355 projector uses the Canon LV-LP11 projector lamp. NOTE: The Canon LV-LP11 contains mercury and should be properly recycled. Don’t throw it into regular garbage. Unplug the electrical cord on the Canon LV-7355 so there is no chance the projector could get turned on during the installation. The Canon LV-7355 operates under high temperatures so give it at least one hour to cool down before opening the projector to change the projector lamp. Loosen the three screws holding the Canon LV-LP11 projector lamp cover in place. 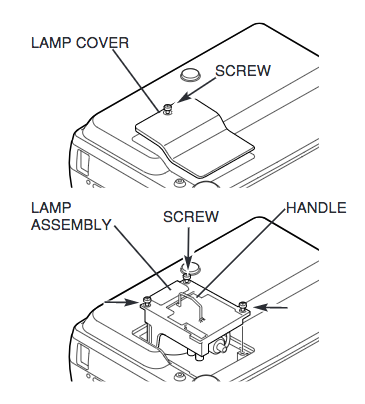 Replace the lamp assembly with a new Canon LV-LP11 projector lamp. Be careful not to touch the actual bulb as oil from your fingers can leave black marks on the lamp. 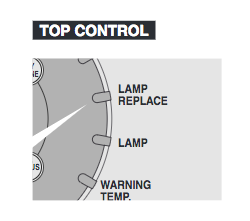 Tighten the screws on the new lamp. After replacing the Canon LV-7355 projector lamp, you’ll need to reset the lamp so the projector can accurately track the hours left. Press MENU button and ON-SCREEN MENU will appear. Press POINT DOWN button to move to LAMP COUNTER RESET? Press SET button. 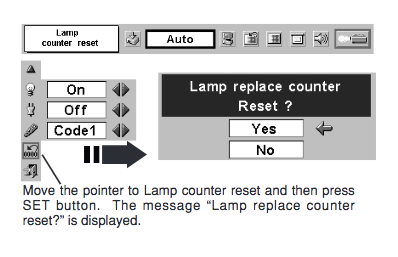 The message “Lamp replace counter reset?” is displayed. Move the pointer to [Yes] and then press SET button. Top tips for extending projector lamp life. Tagged with: authentic lamp, Canon LV-7355 projector, Canon LV-7355 projector lamp, Canon LV-LP11 projector lamp.